Many people are under the allusion that because they don't own any farm land or have any agricultural responsibilities then they have no use for a Compact Tractor. As one of the most versatile and useful machines available on the UK market; the Compact Tractor has a myriad of uses for anybody with access to a reasonable amount of land. Living in a temperate country leaves the UK prone to a wide number of different weather problems that we are not entirely prepared for. Heavy snow fall may only occur once or twice a year but when it does, the authorities seem disgustingly ill-prepared for such a situation. Uncleared snow can cause a number of problems. Travel to and from your property could be hugely interrupted. If you and your family have work or school to go to, then vital lessons and shifts could be missed. Alternatively if you operate your business from your home, customers may be unable to reach you. The Compact Tractor is ideal for clearing roads, lanes and paths thus making travel possible. Other weather forms can bring similar connotations. Wind can knock trees or pillars into the road. Most Compact Tractors are strong enough to move these obstacles, clearing the path for vehicles to get through. As well as moving and destroying; the Compact Tractor is perfectly suited to creating and building. The ability to move large and heavy materials and resources for miles and miles is hugely beneficial. Building sites are often uneven and hazardous for some vehicles to traverse. 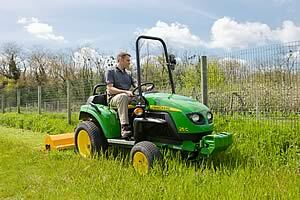 However the durability of the Compact Tractor allows it to move over such ground effortlessly. Adept at road travel; the Compact Tractor is well suited to transporting the resources straight from the merchant to the building area.